Women now have a surprising new reason to go on the pill. Birth control pills have been around since the 1960s, when they offered women a revolutionary degree of control over their reproductive capabilities. Over the years, the formulation of "the pill" has changed, but it remains one of the most widely used, and most effective, forms of pregnancy prevention. This week, a very large new study in The Lancet Oncology reported that use of birth control pills provides a significant, and surprisingly large, reduction in the risk of endometrial cancer. The benefit lasts for decades–women who used the pill in the 1960s have the same reduction in cancer rates as women who took it more recently. This is very good news for women. The new study combined data from 36 earlier studies covering a total of 27,276 women with endometrial cancer and 115,743 without it. The authors–a large group called the Collaborative Group on Epidemiological Studies on Endometrial Cancer–have been working for ten years to collect and analyze this massive data set. Overall, they found that the risk of endometrial cancer in women who had used the pill was only 69% of the risk in women who had never used it. The benefit increased with longer usage: for every 5 years on the pill, women had a 24% reduction in the relative risk of cancer. 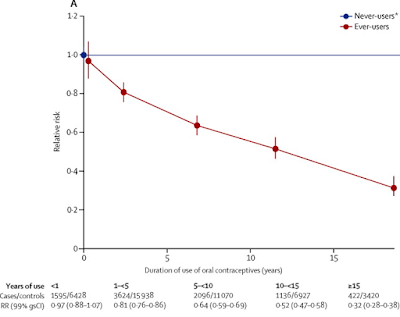 Relative risk of endometrial cancer (red line) based on how many years a woman used birth control pills. From "Endometrial cancer and oral contraceptives: an individual participant meta-analysis of 27,276 women with endometrial cancer from 36 epidemiological studies", published online 4 August 2015 in The Lancet Oncology. Endometrial cancer is the most common gynelogical cancer, accounting for 6% of all cancers in women. The National Cancer Institute estimates that in the U.S., 54,870 women will be diagnosed with endometrial cancer in 2015, and 10,170 will die. "In high-income countries, 10 years use of oral contraceptives was estimated to reduce the absolute risk of endometrial cancer arising before age 75 years from 2.3 to 1.3 per 100 women." The benefit is even larger for women who used the pill longer: after 15 years the risk of cancer drops to 1%. The authors estimate that over the past 50 years, the pill has prevented 400,000 endometrial cancers in western Europe, the U.S., and Australasia, including 200,000 in the past decade. Now there's a new and very different reason to provide birth control pills as part of health care coverage. Time will tell whether this dramatic cancer prevention benefit will trump the objections of those who want to deny women access to the pill. 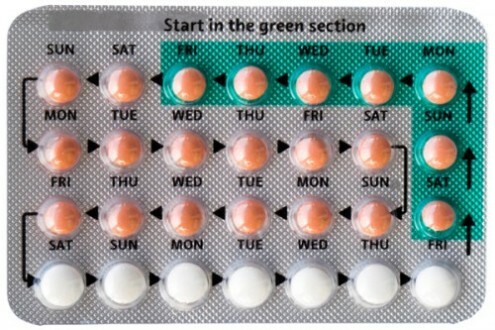 It's not all rainbows and butterflies with these birth control pills. My girlfriend had to stop taking them once spots started to appear on her breast scans. Anecdotes do not invalidate good studies. I know someone who can't take birth control pills because it causes weeks of uncontrollable bleeding. Everything in life has side effects, alas. That doesn't mean we should stop the sale of birth control pills, merely be aware that like any drug they can cause adverse reactions. This new knowledge that there is a marked anticancer benefit to the pill should serve as leverage to make it available to all women if they choose. Birth control is much cheaper than cancer, even ten years of pills for 100 women in order to spare one of them from this specific cancer. Well, actually, certain kinds of birth control pills do increase the risk of breast cancer and possibly cervical cancer in women. Family history may also play a role, but it is unconfirmed. The neoplastic effects of hormonal contraceptives have been extensively studied, and recent meta-analyses indicate that there is a reduction in the risk of endometrial and ovarian cancer, a possible small increase in the risk for breast and cervical cancer, and an increased risk of liver cancer. Previous studies of oral contraceptives and breast cancer indicate that recent use slightly increases risk, but most studies relied on self-reported use and did not examine contemporary oral contraceptive formulations. 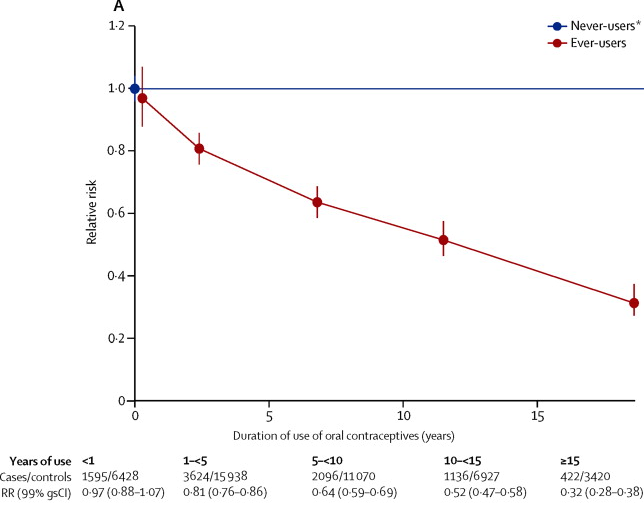 Our results suggest that recent use of contemporary oral contraceptives is associated with an increased breast cancer risk, which may vary by formulation. High-dose estrogen, ethynodiol diacetate, higher dose norethindrone, and specific triphasic oral contraceptives are possibly associated with increased breast cancer risks, whereas low-dose estrogen oral contraceptives and other formulations may not be associated with elevated risks. If you have a family history of breast cancer, you may feel that this increase in risk (however small it is) is not worth taking. Doctors don't think that pill use is likely to change the size of the risk in women who have close relatives with breast cancer. But we don't really have the research evidence to say how pill use might affect breast cancer risk in those with a family history. If you have a history of breast problems, such as benign lumps, you may also feel that you should be extra cautious. It is thought that the oestrogen in the combined pill may cause the increased risk. So it may be better to take a brand of pill that has lower oestrogen. In the UK, most women are automatically put onto a low oestrogen combined pill by their doctors. There has been some research indicating that using the pill increases the risk of cancer of the cervix. The picture is confusing because women who take oral contraceptives are more likely to be sexually active. And may not necessarily use barrier contraception (condom), so they are more at risk of picking up HPV, which is a known risk factor for cervical cancer. Overall, the research suggests that even taking these factors into account, the use of oral contraceptives is independently linked to an increased risk of cervical cancer. Anecdotes do not invalidate good studies. ...sigh... this just sounded so arrogant. Also, OP, Hobby Lobby wasn't disputing their responsibility to pay for daily contraceptives. It's the so-called morning after pill that they had a problem with.